The rear levelling scraper HP-2461 is perfect for the preparation and maintenance of paths and access roads in the agriculture, forestry and municipal administration. It was developed for heavy duty operations and is characterized by professional design, extreme stability and universal applicability. 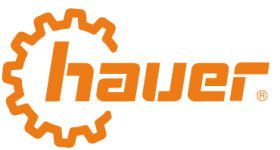 The three possible hydraulic adjustments of the blade result in a multitude of possible applications. The excavation depth of the scraper is changed by raising and lowering the rear hydraulics. For off-center track work the rear levelling scraper can be pivoted 32° to the left and to the right. 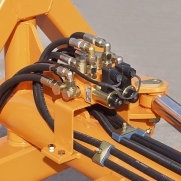 The cylinders for the hydraulic lateral adjustment and for the hydraulic pivoting device are equipped with double shock valves. The inclination of the scoop can be regulated with the hydraulic supporting wheel adjustment. For an exact positioning there is also a check valve. With these functions you can optimally clear up and form V-shaped ditches. Figures and details are approximate and non-binding and change slightly depending on changes in design or construction. Pictures can deviate from the standard scope of supply. Subject to technical changes and errors! 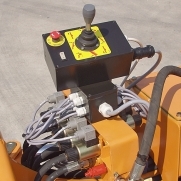 We offer a range of additional equipment for the "HP-2461" which ensures a broad field of application. As standard, the rear levelling scraper is already prepared for the mounting of the optional equipment. This means that refitting can easily be done afterwards at any time. Therefore, the rear levelling scraper can be adapted to different requirements. blade widening - diagonal: blade widening parts for making special slopes or for clearing of ditches. Available for left and right side. rippers: of hardened, wear-resistant special steel (approx. 400HB). The rippers are protected by an overload protection. The preparation for the rippers is standard equipment. discharge stopper: It avoids that levelling material gets lost on the sides. It is available as a straight and diagonal version. 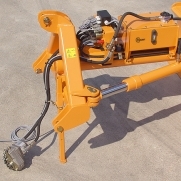 hydraulic supporting wheel adjustment: in case the scraping depth / digging depth is not adjusted by the rear linkage.